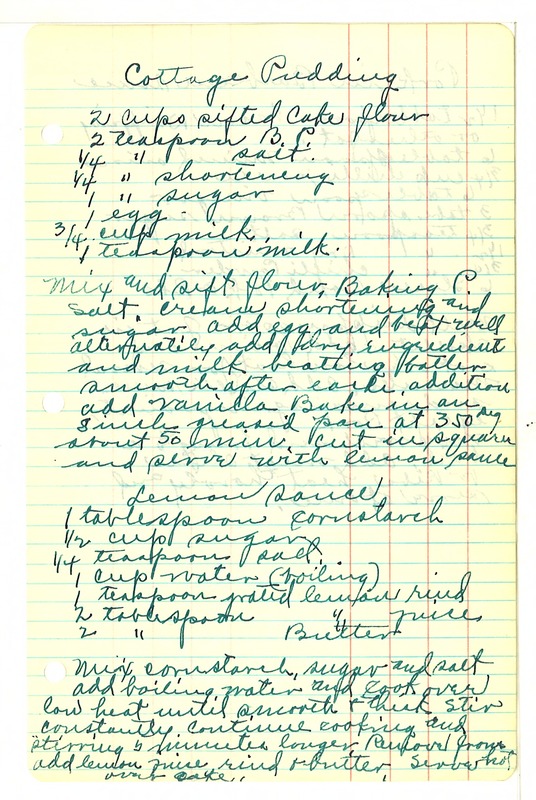 Cottage Pudding 2 cups sifted Cake flour 2 teaspoon B. P. 1/4 " salt 1/4 " shortening 1 " sugar 1 egg 3/4 cup milk 1 teaspoon milk Mix and sift flour, Baking P. salt. Cream shortening and sugar add egg and beat well alternately add dry ingredients and milk beating batter smooth after each addition add vanilla Bake in an 8 inch greased pan at 350 deg. about 50 min cut in squares and serve with lemon sauce Lemon Sauce 1 tablespoon cornstarch 1/2 cup sugar 1/4 teaspoon salt 1 cup water (boiling) 1 teaspoon grated lemon rind 2 tablespoon " juice 2 " Butter Mix cornstarch, sugar and salt add boiling water and cook over low heat until smooth & thick stir constantly. Continue cooking and stirring 5 minutes longer Remove from add lemon juice, rind & butter. Serve hot over cake.